Family: Escalloniaceae R.Br. ex Dumort. Roussea simplex is a climbing shrub, or liana, native to the mountain forests of Mauritius, and is considered to be a 'botanical oddity'. First, it is the only species in the genus Roussea, so if it became extinct we would lose not just a species, but a whole genus and a family of plants. In addition, it has puzzled botanists for many years, because careful study of its form and structure have yielded no clues as to which other plant families it is related to. Recent genetic studies have shed light on this question and placed it close to the Campanulaceae (bellflower family). 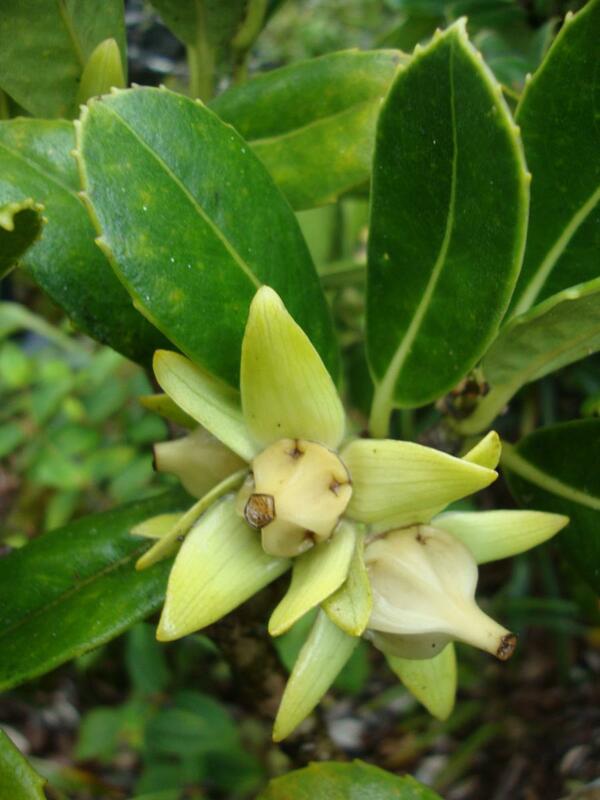 Restricted to the island of Mauritius, Roussea simplex is a critically endangered shrub or liana that is pollinated by a gecko. It is the only species in the genus Roussea, so if it became extinct we would lose not just a species, but a whole genus and a family of plants. 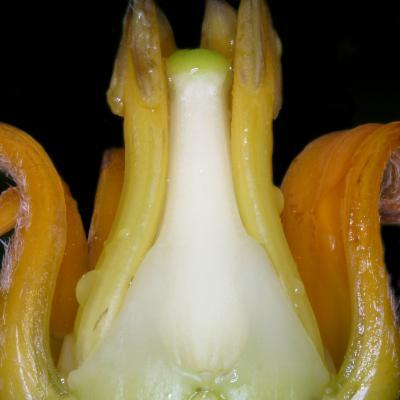 In addition, it has puzzled botanists for many years, because careful study of its form and structure have yielded no clues as to which other plant families it is related to. Recent genetic studies have shed light on this question and placed it close to the Campanulaceae (bellflower family). Roussea simplex is restricted to the island of Mauritius in the southwest Indian Ocean, where only two small populations have been recorded. Overview: Roussea simplex is a climbing shrub, or liana, that can form bushes. 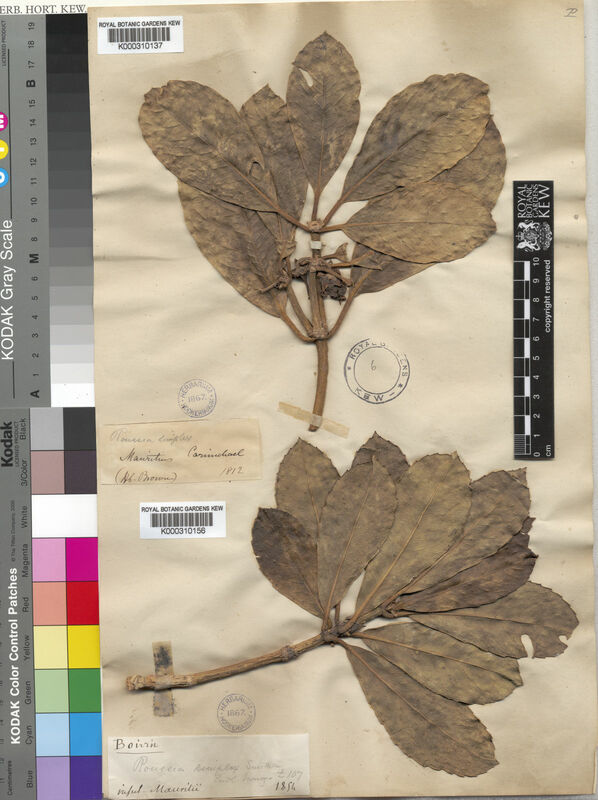 It has cylindrical stems, on which the leaves are held opposite each other. Leaves: The leaves have a toothed margin and are glossy on the upper surfaces but 'furry' and grey on the undersides. Flowers: The attractive, bright orange flowers are bell-shaped with four or five rather thick petals. 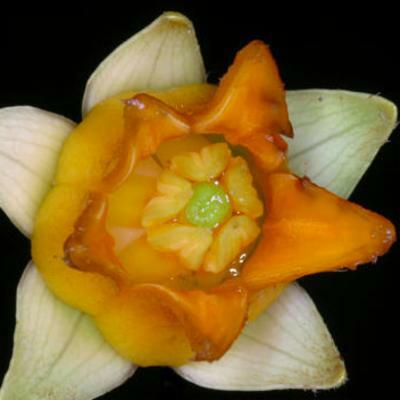 The flowers have nectaries that secrete large quantities of yellowish nectar. 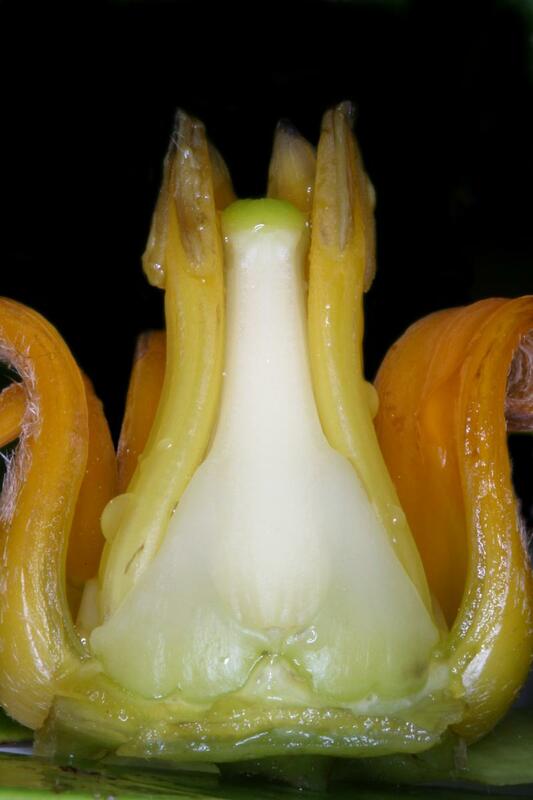 The sepals are retained when the fruits ripen. Fruits: The fruits are conical and ridged, with an almost star-like appearance when viewed from above. 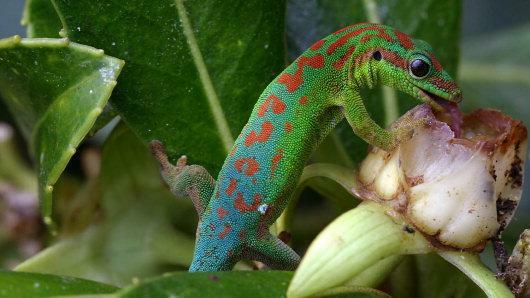 The flowers are pollinated and the seeds dispersed by the Mauritian blue-tailed day gecko ( Phelsuma cepediana ). Strangely enough, the only known pollinator of Roussea simplex is a reptile: the rare, endemic Mauritian blue-tailed day gecko ( Phelsuma cepediana ). 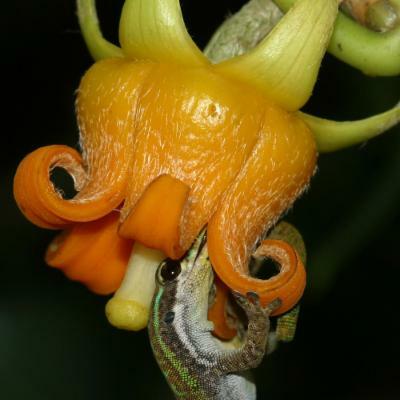 This colourful reptile climbs the plant to reach the flowers and feed on the abundant nectar, pollinating the flowers in the process. 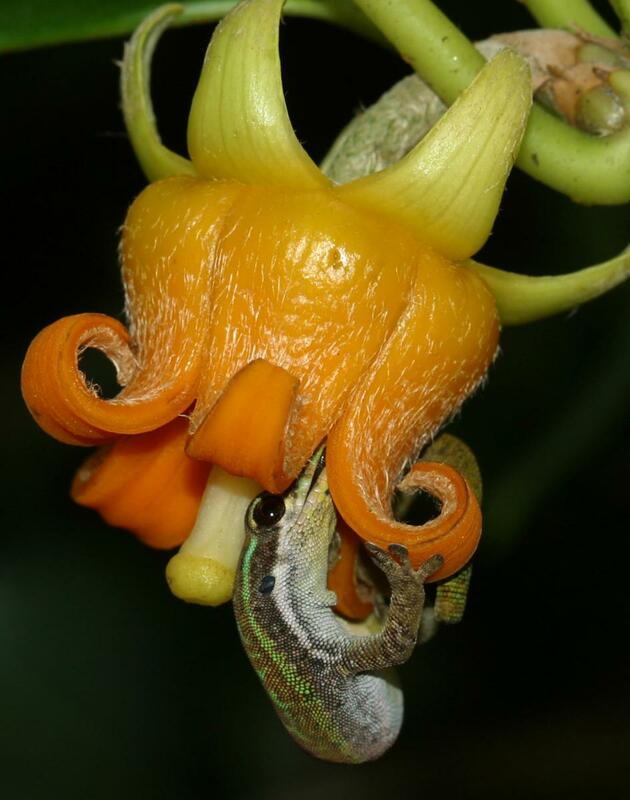 But the interaction with the gecko does not end there - the fruits have the shape (and to some extent, the function) of the teat of a baby-bottle and secrete a 'jelly' that contains minute seeds. This secretion is licked and eaten by the blue-tailed gecko, which in turn disperses the seeds in its droppings. Islands such as Mauritius are well-known for having plants with unusual pollination systems, some of which have been studied recently by scientists at Kew. An example is the orchid Angraecum cadetii found on Réunion Island and pollinated by the 'raspy cricket'. 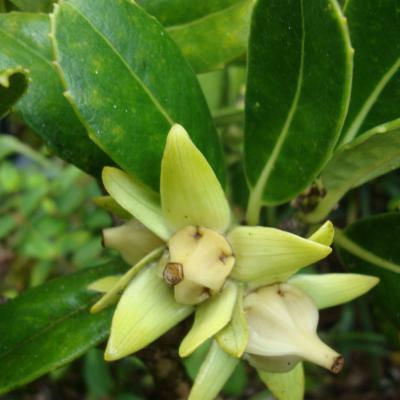 Although recorded as being common on Mauritius in 1937, Roussea simplex is now considered to be Critically Endangered: only about 85 plants, distributed between a few scattered populations, are known to remain. This dramatic decline is thought to be due to the extensive deforestation of the island and the introduction of exotic animals such as rats, pigs, and goats which grub up or eat the seedlings, and many invasive species of plants, such as guava ( Psidium cattleianum ) and travellers' tree ( Ravenala madagascariensis ) which compete for resources. Curiously, this species is also threatened by a tiny alien animal. The ant Technomyrmex albipes (native to the Indo-Pacific area, but introduced to Mauritius) constructs walls of clay that seal the flowers, which it then uses as 'stables' to confine mealy bugs. The mealy bugs feed on the sap of the plant and secrete drops of a sugar solution which are then drunk by the ants. Interestingly, it is not the sap-sucking of the mealy bugs that harms the plant the most. The real problem is that the ants will attack any blue-tailed day gecko that climbs onto the plant, thereby preventing the plant's reproduction, the gecko being the only known pollinator. Attempts to cultivate Roussea simplex from seed in Mauritius have been unsuccessful until recently; not a single seed could be germinated. The tiny seeds are embedded in a jelly-like pulp, which must be removed to prevent the seeds from rotting, and it has been very difficult to separate them in practice. In the wild, this jelly coating is digested during its passage down the blue-tailed day gecko's gut. Some seeds were finally cleaned by macerating the jelly in water for a few hours and then decanting the liquid to separate it from the seeds. Kew horticulturist Carlos Magdalena brought some seeds to Kew in May 2010, and finally succeeded in getting three seeds to germinate and grow into seedlings in the summer of 2010. These are still in Kew's glasshouses. Kew horticulturist Carlos Magdalena had been warned by the Mauritian National Park Service staff that he would be likely to face difficulties when attempting to grow this species from seed, and so therefore decided to try a different technique to sowing the seeds in a traditional way: an unripe fruit was harvested in the field, its outer surfaces were sterilised and it was placed in a sterile flask. This flask was then transported to Kew's Conservation Biotechnology (micropropagation) Unit, which it reached less than 36 hours after collection, and work on trying to culture the embryos contained in the seeds began. As a result of this trial, several plantlets are currently growing under the care of Kew's Dr. V. Sarasan, though he estimates it may take more than a year before plants can be extracted from the sterile cultures. It is hoped that by the time we can remove them, the lessons learnt from the few plants that are currently being grown using standard methods will provide vital clues on how to cultivate this plant using both tissue culture and standard horticultural techniques. These are just the first steps in Kew's attempt to conserve this interesting species. Roussea simplex is currently being grown behind-the-scenes in Kew's Tropical Nursery and the Conservation Biotechnology (micropropagation) Unit. Critically Endangered (CR) according to IUCN Red List criteria. Bosser, J. & al. (eds.) (1997). Flore des Mascareignes 81-89: 1. IRD Éditions, MSIRI, RBG-Kew, Paris. Hansen, D. M. & Müller, C. B. (2009). 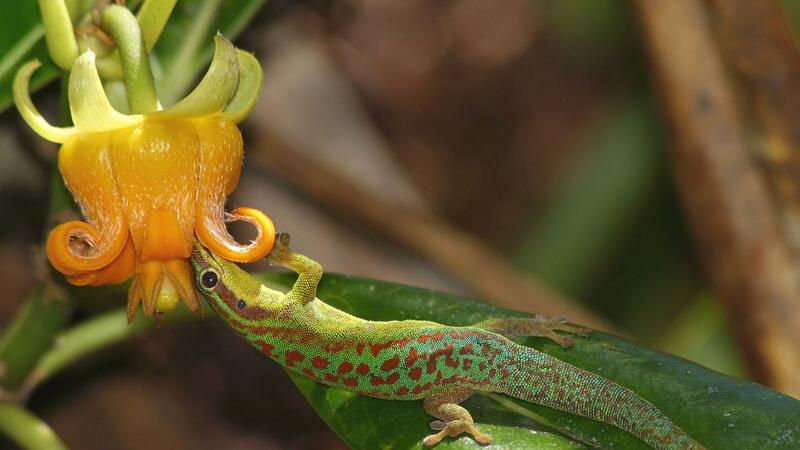 Invasive ants disrupt gecko pollination and seed dispersal of the endangered plant Roussea simplex in Mauritius. Biotropica 41: 202–208. Hansen, D. M., Beer, K. & Müller, C. B. (2006). 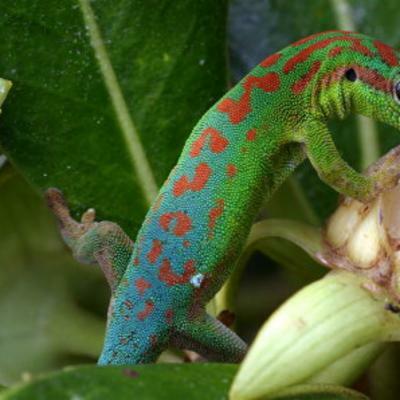 Mauritian coloured nectar no longer a mystery: a visual signal for lizard pollinators. Biol. Lett. 2: 165–168. Hansen, D.M. (2005). 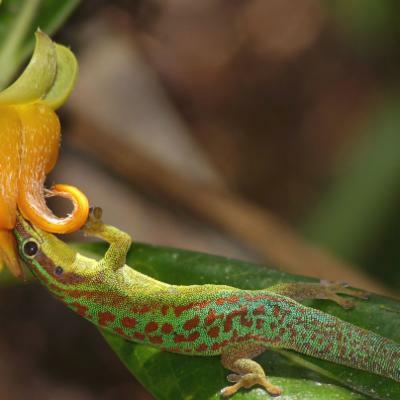 Pollination of the enigmatic Mauritian endemic Roussea simplex (Rousseaceae): birds or geckos? Ecotropica 11: 69–72. Lundberg, J. (2001). Phylogenetic studies in the Euasterids II with particular reference to Asterales and Escalloniaceae. Acta Univ. Ups. Comprehensive Summaries of Uppsala Dissertations from the Faculty of Science and Technology 676.